Nearly 70 years or so after the execution of Jesus of Nazareth, the anonymous gospel-story-teller that we know as John told a story of resurrection. According to this story, a bunch of rag-tag Jesus followers were huddled together in fear. Their beloved leader had been brutally executed by the powers that be and they were terrified that they would be next. Paralyzed by their fear, hiding behind a locked door, something happened that gave them the strength to burst forth from their own tomb and change the world. I believe that the anonymous gospel-story-teller that we know as John wrote his story the way that he wrote to address the fears of the people of his community. After the execution of Jesus, conditions got a whole lot worse for the Jewish people. The Roman Empire destroyed the Temple in Jerusalem, nearly 20 years before this story was written. The Jewish rebellion was brutally squashed by the Empire. The followers of Jesus, known then as the followers of the Way were actively persecuted by the Empire who saw them as a dangerous Jewish sect. This particular story of resurrection was told by the way it was told to speak directly to the fears of the followers of the Way. It is the story of followers of Jesus huddled together in fear! This fear would have been well understood by our anonymous-gospel story-teller’s first audience for they too lived in fear. According to the story, paralyzed by their fear, hiding behind a locked door, something happened that gave them the strength to burst forth from their own tomb and change the world. Ever since they began to practice resurrection, people have been trying to figure out exactly what may have happened. What could have changed these bumbling, terrified, betrayers, abandoners, who seemed to be always getting things wrong, into a bunch of leaders who began a movement that spread throughout the Empire within their own life-times and then based on the power of their witness, spread throughout the world and continues to nourish and sustain millions of people from generation to generation? Now there are those that insist that it was the power of Jesus having been physically resuscitated from the dead that motivated his followers to change their lives and the lives of millions who have come after them. But we live in the 21st century and we have access to all sorts of information that the generations who have gone before us did not. 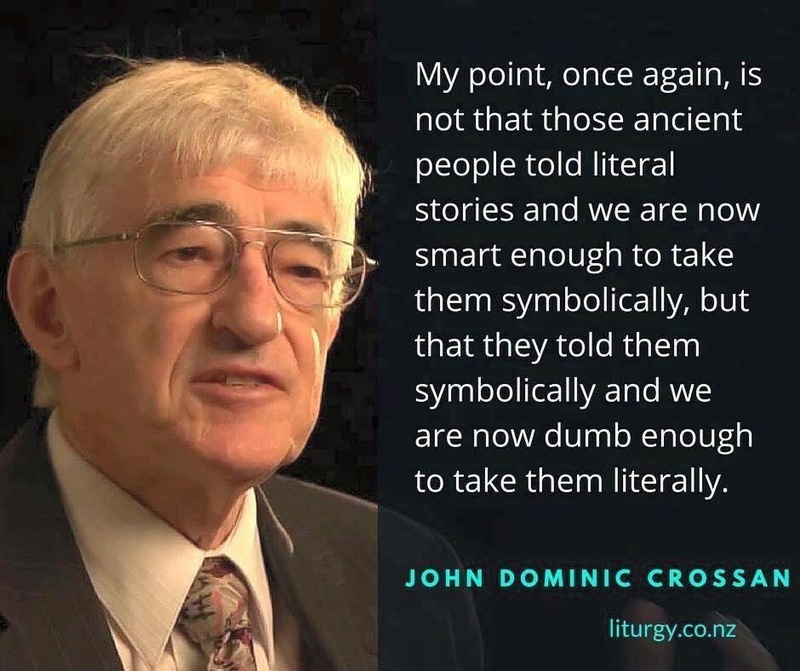 Our friend, Dom Crossan makes the point that, “it is not that those ancient people told literal stories and we are now smart enough to take them symbolically, but that they told them symbolically and we are now dumb enough to take them literally.” I believe that in order to understand the power of this particular story of resurrection we must move beyond simplistic literal explanations and open ourselves to the more-than-literal symbolic – dare I say it, spiritual understanding of resurrection. It is long past time for us to move beyond arguments about a physical resuscitation of Jesus’ body. The reality that the early followers of the Way never mentioned the physical resuscitation, that the Apostle Paul wrote that such questions were in fact “stupid” ought to give us the courage to see the notion of a physical resuscitation of Jesus’ corpse for the late first century development that it was. It is long past time for us to embrace the power of resurrection. I can tell you without a doubt that I believe in resurrection and I know that Christ is risen, and I also know that the same power that the early followers of Jesus used to change the world is available to you and to me. Now, more than ever the world needs us to start using that power. Believing in resurrection is not the point. It’s time for us to start practicing resurrection. So, if they weren’t talking about a physical resuscitation when they spoke of Jesus’ resurrection, what did the early followers of Jesus actually mean when they spoke of Jesus having been raised from the dead? The idea that God would one day raise up the dead was not particularly popular with the priestly party in Jerusalem, perhaps because they had come to terms with the occupation forces of Rome, but it appealed strongly to some Pharisees who insisted that God would see to it that ultimately justice would prevail.Biblical scholars suspect that Jesus and his followers shared the Pharisees’ hope for resurrection. Each of the synoptic gospels, the anonymous gospels that we know as Mark, Matthew and Luke, tell a story about how members of the priestly party, known as the Sadducees, came to Jesus with a trick question that was intended to show the absurdity of the resurrection, but in each story, Jesus cleverly avoids their trap.That the editors of the first three gospels chose to include these stories, suggests that at least by the end of the first century resurrection imagery was important to the followers of Jesus. But exactly what they meant by resurrection is not clear. When early Christian writers used these terms, they may have been thinking like Pharisees and insisting that God would prove God’s-self to be just. Many New Testament scholars see the stories about the risen Christ as examples of hymns of praise or poetic expressions of the faithful whose lives had been transformed by their encounters with the Jesus story.The apostle Paul never mentioned the empty tomb and his own description of his encounter with the risen Christ is one of a vision of Christ rather than an actual physical encounter. Paul uses the Greek verb for “appeared” when he describes both the apostles’ encounters and his own with the risen Christ. But, New Testament scholars can parse the words of the gospels forever and they are never going to be able to tell us exactly what the early followers of Jesus meant when they said that, “Jesus is risen.” What we can know about their understanding of resurrection can be found in the events that followed Jesus’ execution. Crucifixion was designed by the Romans to terrorize the nations they occupied. Corpses were left on display so that the people would understand that if they stepped out of line in any way, the horror or crucifixion was all they could hope for. The terrorizing of the population worked well for the Romans. For a while Jesus’ followers were terrified. But death could not contain the power of their experiences with Jesus. And it wasn’t long before they were living not as terrorized citizens of the Roman Empire, but as liberated followers of the way, banding together in communities of compassion, sharing their wealth, ensuring that none were needing among them, risking it all, for the sake of Jesus vision of God’s reign of justice and peace. When I read the accounts of those early followers of the way who abandoned the tomb of the upper-room to gather together to build communities of compassion it is clear to me who was raised up by images of resurrection. The followers of Jesus were lifted up from a crouching or cowering position as they boldly proclaimed what they had learned from Jesus. The followers of Jesus stood up and got on with the business that was begun by Jesus. The followers of Jesus began to understand themselves in a whole new way. The Apostle Paul wrote: “We who are many, are one body in Christ, and individually we are members one of another.” “Now you are the body of Christ and individually members of it.”By merging the pharisaic image of resurrection with the image of the body of Christ the first Christians could declare with confidence that, “Christ is risen.” When followers of Jesus in the first century and in the twenty-first century talk about the resurrection of Christ, we are proclaiming that death did not have the last word in the Jesus story because his followers were raised up to be his body right here, right now. When we say that we believe in the resurrection of the dead, we are proclaiming that no matter how dead someone may appear to be, no matter how dead we may feel, new life is always possible. Practicing resurrection begins when we huddle together refusing to let our fears entomb us. Practicing resurrection happens when we gather together to build communities of compassion.Resurrection is not a solitary endeavor. Practicing resurrection requires that we gather together sharing our gifts, talents and treasure for the good of all. Practicing resurrection happens when we empower one another to rise.Practicing resurrection happens when we build communities of compassion that live fully, love extravagantly and empower people to be all that they were created to be. Let it be so among us. Let us be a community of compassion. Let us always seek ways to empower our neighbours and ourselves to live fully, love extravagantly be all that we were created to be. Let us practice resurrection here and now! Let us Rise! Resurrection didn’t just happen way back when. Resurrection happens when we refuse to be cowered by our fears. Resurrection happens when we standup in spite of our fear. Resurrection happens when we empower our sisters and brothers to rise up! Let us rise. Let us be the Body of Christ. Let us rise! Let us rise in the name and for the sake of the LOVE who is God! This entry was posted in Adult Education, Bible Study, Evolutionary Christianity, Poetry, Progressive Theology, SERMONS, STORIES, Theology and tagged And Still I Rise, doubting thomas, Easter Sermon John Dominic Crossan, Lutheran sermon Easter 2B, Mya Angelou, progressive Christian sermon Easter 2B, progressive Christian sermon John 20:19-31, progressive Christian sermon resurrection, progressive christian spirituality, progressive christianity, progressive theology, spirituality by Rev. Dawn Hutchings. Bookmark the permalink. What a Great Easter Sermon!!!!!!!!!!!!! !Pastor Dawn Hutchings Reminds us that Resurrection Living Calls us To “Stand Up”, “To Wake Up” to New Life Within Our Own Being and Live with Compassion and empowerment to the well being and dignity of others and all of humanity!